Get ready for the dopest show of the year!! 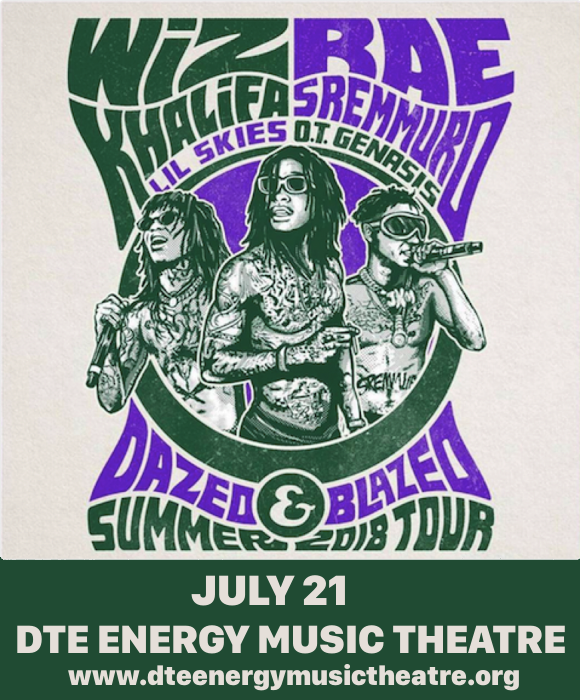 That’s right, massive rapper Wiz Khalifa is teaming up with hip-hop duo Rae Sremmurd for a HUGE tour around the US, coming to the DTE Energy Music Theatre on Saturday 21st July 2018 – don’t miss it!! Get your tickets NOW before they sell out! Since 2006, Wiz Khalifa has been a steadily rising force on the hip-hop scene. The release of his debut album, “Show And Prove,” led to his signing with Warner Bros. records the following year. His single “Say Yeah,” received widespread urban radio airplay. After parting with the label, he released his second album, “Deal Or No Deal,” followed by the mixtape “Kush and Orange Juice,” leading to a record deal with Atlantic Records. His first single for the label, and possibly his best-known yet, was his first to chart at number 1: “Black And Yellow,” which became an anthem for several Pittsburgh sports teams. Following that, he released “Rolling Papers,” and is about to follow that up with the second in the series, “Rolling Papers 2”. Get ready to hear all the new sounds live – get your tickets today! !